Puget Sound counties deploy innovation to use nature’s best water quality indicators, improve data integrity and access to information for science-based decisions. 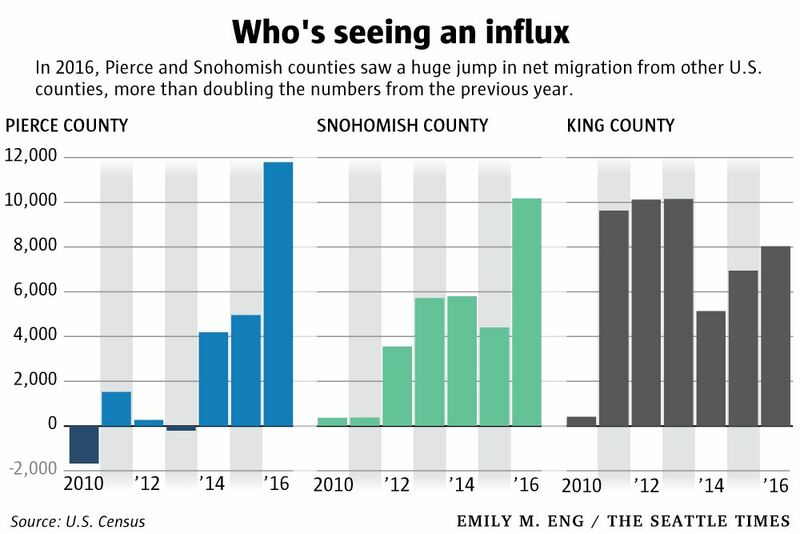 Of the more than 3,100 counties across the United States, none saw a bigger jump than Pierce and Snohomish in movers from other counties. They ranked No. 1 and No. 2, respectively, for net increase in people moving in domestically reported The Seattle Times in March, 2017. Growth of the region as a whole is happening faster than the expected long-range average predicted a few years back. In anticipation of continued, rapid and dramatic expansion, Pierce and Snohomish county leaders made a commitment to maintain good quality of life for their communities. Their love of clean water began with ensuring good water quality data. Existing databases of long-term hydrologic and water quality data were well-designed. They automatically migrated data from a variety of sources, performed data verification checks, and made data accessible to internal and external users through a searchable website. These systems were effective tools when they were first created, but now they were pushing 20 years. The servers and custom-built databases were no longer supported, and the coding languages for the web applications outdated. Data systems on which the surface water management utilities relied to reduce flood risks and prevent water pollution were at high risk of losing functionality. The capacity for staff to appropriately store, manage, analyze and report data to county decision-makers and the public would be significantly impaired. In critical events, every second counts. And in less urgent cases, personnel do their best to meet high expectations of customer service. Utility leaders desired a commercial software application to meet current core functions and prepare for future needs. Beyond storage and management of continuous data on water quantity and precipitation and discrete water quality data from monitoring lakes, streams and rivers, the updated systems now take into account temperature as well as more powerful and efficient monitoring using benthic macroinvertebrates (BMI). Biological assessments are a valuable approach to measuring water quality, but agencies have faced daunting challenges to store, manage and report associated complex meta data in order to meet stringent Quality Assurance Project Plan (QAPP) requirements. Different BMI sampling methodologies, diversity of taxonomy, and changing classifications of organisms made it difficult to store ecological data with hydrological and water quality parameters until now. KISTERS’ single system further empowers Pierce and Snohomish county staff to create custom data fields and configure data types without vendor support. The agencies are making effective use of nature’s best water quality indicators and advanced information technology. Collecting a higher volume of data wasn’t enough. Agency managers required access to the most reliable information. Automated data validation processes are still in place as new data stream into newly deployed systems, which automatically record every and all data transactions. System managers are now able to track data processing activities to the software user who edited the data point, a combined date and time stamp, and an explanation for the change. In addition to meeting IT network architectural and security needs, the water information solution KISTERS provided each county had to provide access to hydrological and water quality data across county departments and external stakeholders such as neighboring jurisdictions, Washington State Department of Ecology, federal agencies, and private consulting firms. Controlled access to the new system is accomplished with user administration profiles and login credentials for authorized users. Furthermore, internal or external users can access dashboards preconfigured for information needs relevant to them. As information becomes more available and immediate to public officials and the public, understanding the scientific background to fully vet all considerations becomes crucial. Environmental scientists, analysts and engineers employed by Pierce and Snohomish counties focus their technical expertise on managing stormwater systems, monitoring watersheds to detect and respond to environmental threats. Moreover, they’re building partnerships to improve ecosystem health in the region: keeping pollutants out of shellfish beds, participating in salmon recovery efforts and restoring Puget Sound and its connected waterways. They aren’t distracted by data loss, cyber threats or troubleshooting outdated databases. Their analytical minds aren’t busy devising workarounds to inefficient or failing technology. Instead, their curiosity remains on their work and solving problems that are usually complex. To support science efforts, KISTERS invites county IT counterparts to help administer the new water data platforms. At a glance, the state-of-the-system dashboards give an overview of performance issues. 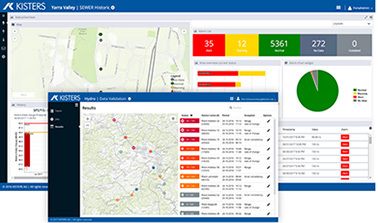 Color coding identifies priorities for immediate response, while archives allow users to view historical alarms or data processing tasks over a set period of time. Better identification and measurement of these performance issues allows system administrators to proactively fix them rather than getting IT involved under more tense circumstances. KISTERS advocates that environmental data IT performance is taken as seriously as other business-critical areas of county operations, especially with the influence of environmental quality on both the quality of life and economic development. As regions are outpacing expected growth rates, county water utilities are improving customer service and getting ahead of challenges by readying their scientific and IT professionals and retiring outdated databases. Science-based decisions to sustain clean water supplies are supported by efficient collection and analysis of data from wider and better water quality indicators, higher standards of data integrity, and more open communication of information to policy makers, environmental partners and the public.